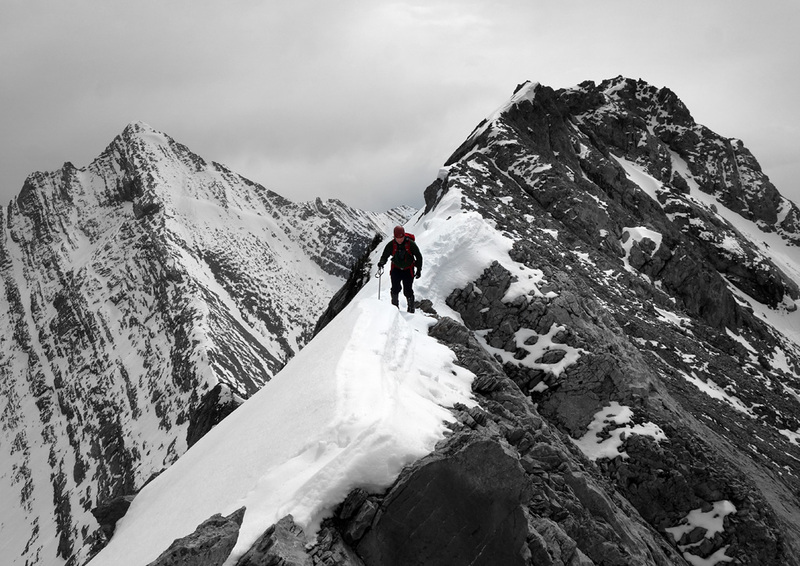 Finding a western approach on a difficult mountain. 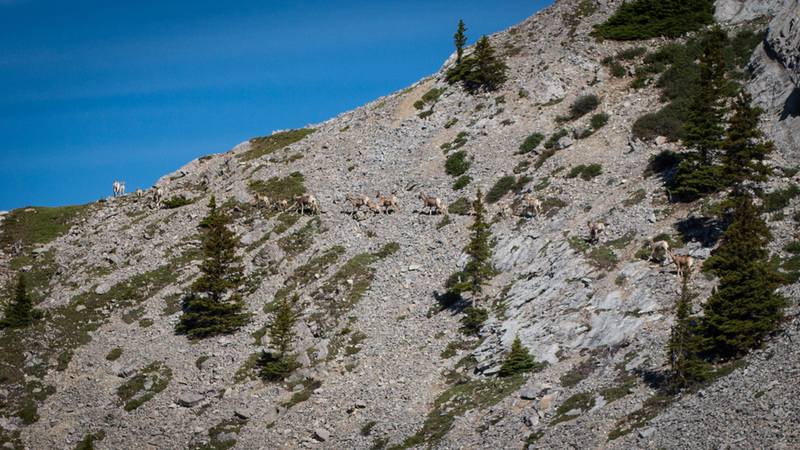 The summit block on McGillivray offers no easy lines. 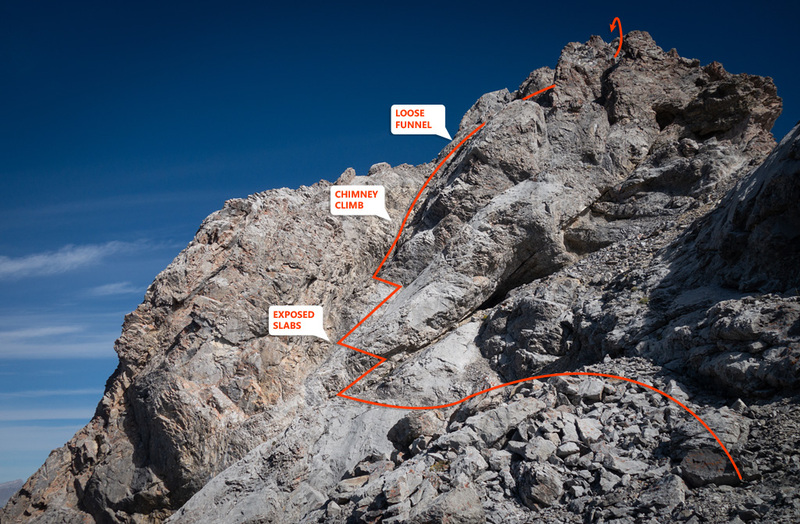 Expect difficult exposed scrambling. 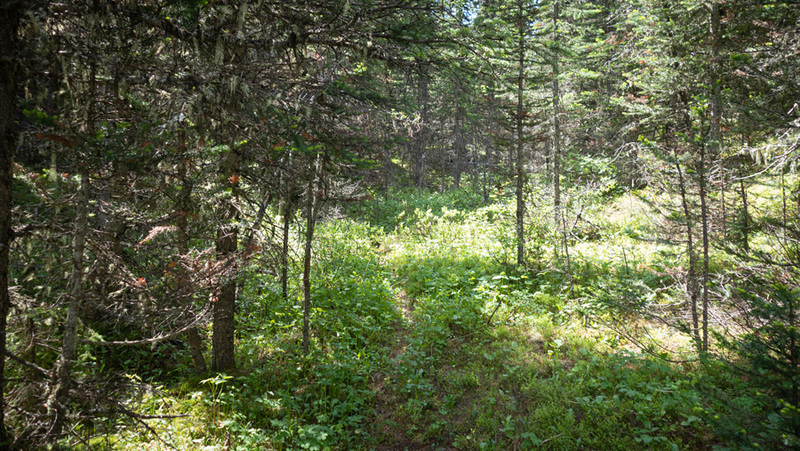 The approach route has a vague forest section between two trails, with the latter being faint and somewhat overgrown. Bring a GPS unit. Back in May 2015, Brandon Boulier, I and a few other members of the CSMC made an attempt on Mt. McGillivray from its traditional approach from the Trans Canada Highway. 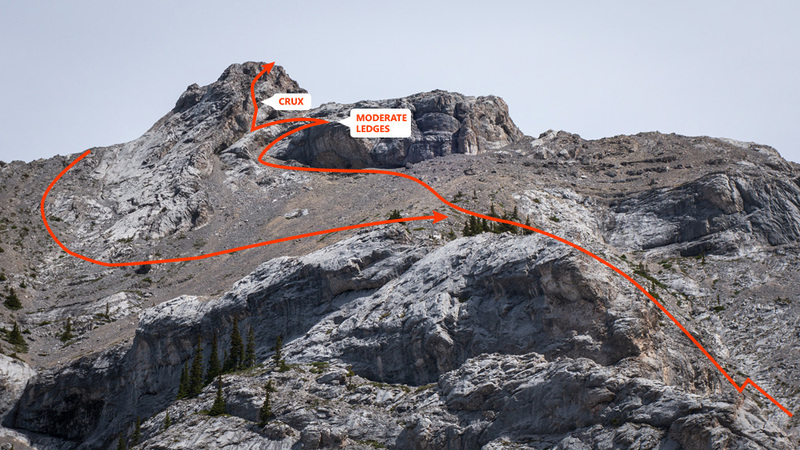 After bypassing a giant buttress, completing an epic amount of sidehilling, and working through some tricky routefinding up and around blind corners, we finally reached the summit ridge. Five hours of work and 1,345m of elevation gain came to a halt when we found the crumbly, super-exposed ridge we were expecting to challenge us covered in knee deep snow and dangerous cornices. The hike out gave us plenty of time to dwell upon the failure. 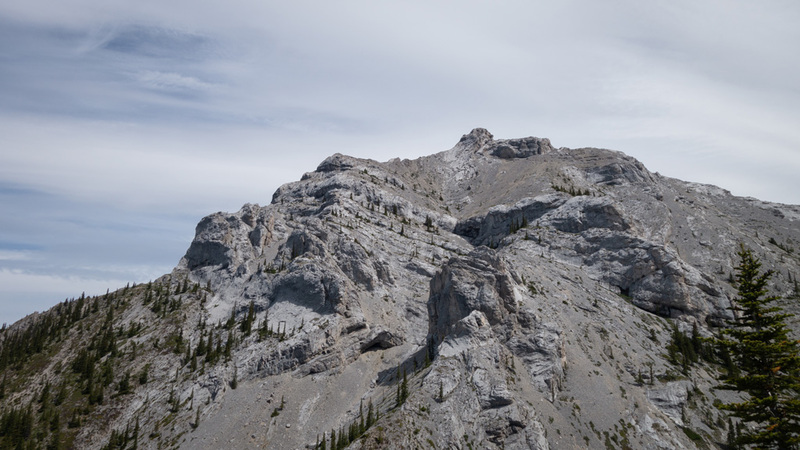 After the trip, I began to find occasional reports from users summiting McGillivray from the southwest, having improvised a route from Skogan Pass. The idea struck me as a more promising approach and, using fragmentary details from Sid Cupido, Alex Privalov and my friend Raf, set off to avenge my first go at the mountain. The day begins at the amusingly named “Mt. 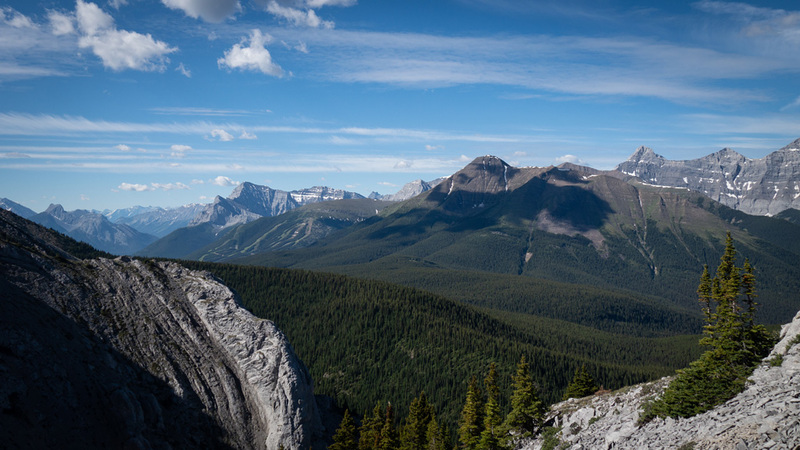 Lougheed Viewpoint” which, despite its implied promise, provides an inferior view of Mt. Lougheed than the highway. 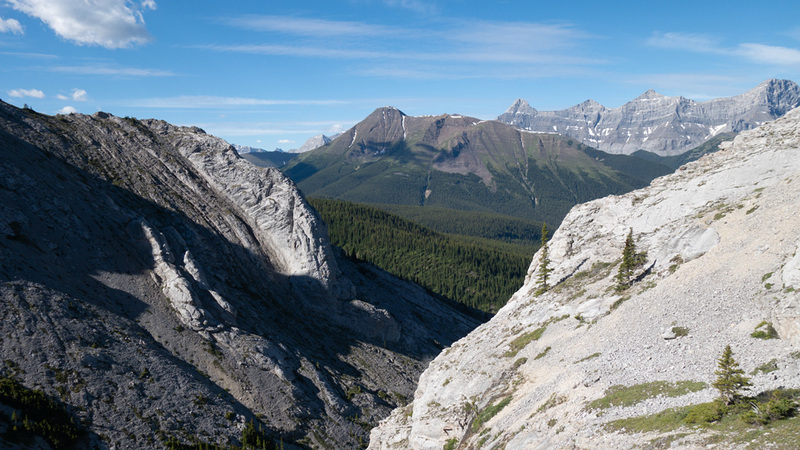 To get there, exit Highway 1 at Dead Man’s Flat and follow a gravel road south to a parking area adjacent to the Banff Gate Mountain Resort. Within the first few minutes from the parking area, you’ll come upon a 4km stretch of an open cutline which blasts its way up a forested hillside to the southeastern horizon. The trail here is wide and follows a gentle grade, so many people opt to bike this approach with the promise of an effortless, turbocharged return. I’m a terrible cyclist; the prospect of pushing a bike several kilometres to save time on the way back didn’t appeal to me. So I hiked it. It’s worth noting that hikers often encounter bears along this trail, so have your spray with you. When you reach that initial horizon, the road will take a sharp turn to the left while a well-worn trail continues in a straight line towards the pass. While it will feel counterintuitive, stick to the road. 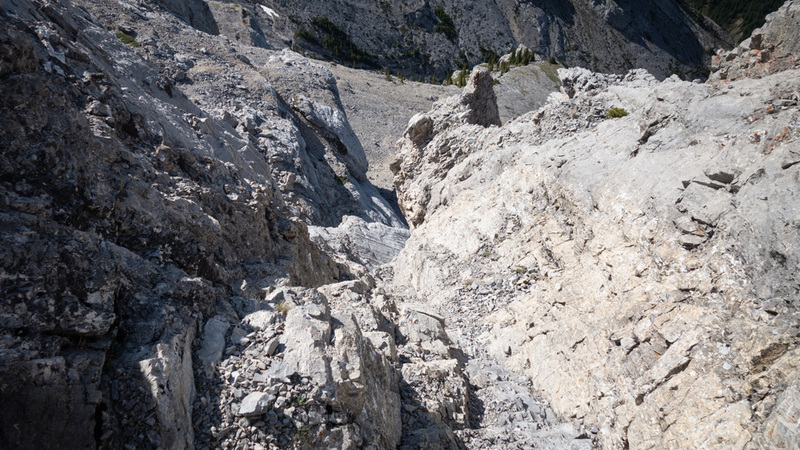 That side-trail comes to a sudden halt about half a kilometre further. I explored that purely out of a sense of duty to thoroughness and not as the result of a navigational error, obviously. 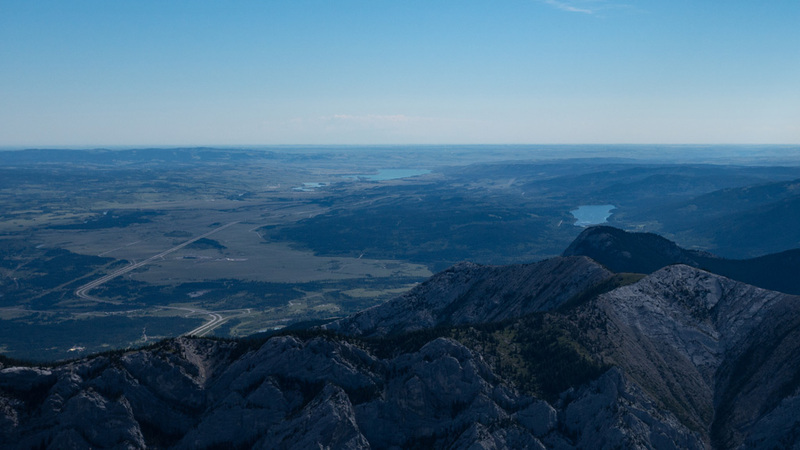 After a few broad switchbacks on the road, you’ll pass the signed trail for Pigeon Mountain; an easy scramble who’s most notable feature is a seasonal closure during the only period of the year (before June 15th) that you would want to scramble it. 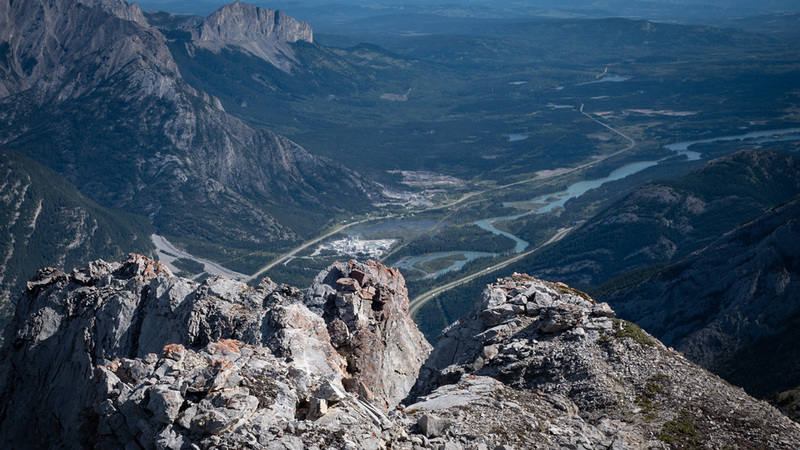 At this point, you’ll be about 1.2 km from your turn-off and may want to keep your GPS device handy as you will need to improvise a link between the Skogan Pass trail and one which follows McGillivray Creek. As with most improvised routes, you tend to get it better on the return, and my experience was no different. If using my track as a reference (recommended), you will want to follow my downtrack. 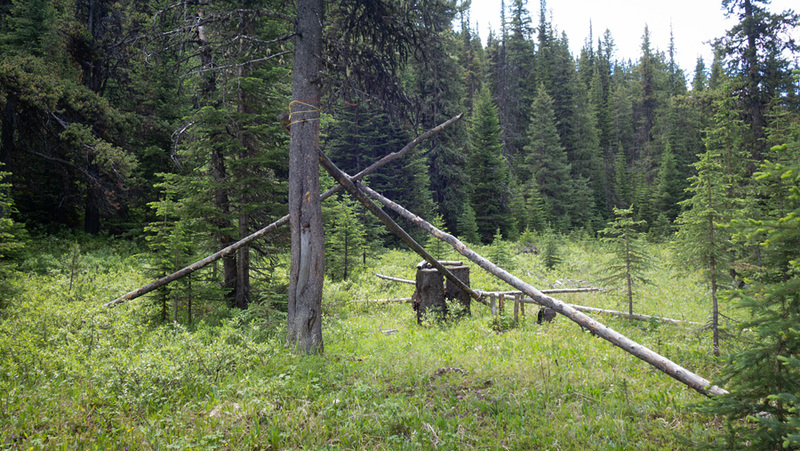 I was able to link reasonable gaps in the forest all the way to the remnants of an old campsite in a clearing that’s right on the target trail. Note that the trees have many tracks within them, but they all either end abruptly or turn away from your desired direction of travel. The McGillivray Creek trail is like that bridge from the Indiana Jones movie; faint to the point where you can only really see it as you stand upon it, but it gets the job done. 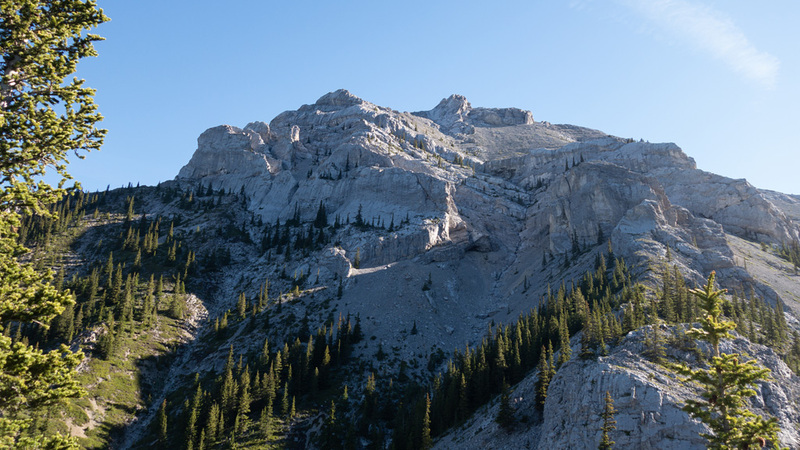 After 15 minutes of low-aiming your way along the creek, the trail will turn to the right, climb over a gentle hillside, and then drop to a broad, rocky drainage coming from Skogan Peak. You won't get your first clear view of McGillivray until you've gained a lower ridge on Skogan's northwest flanks. 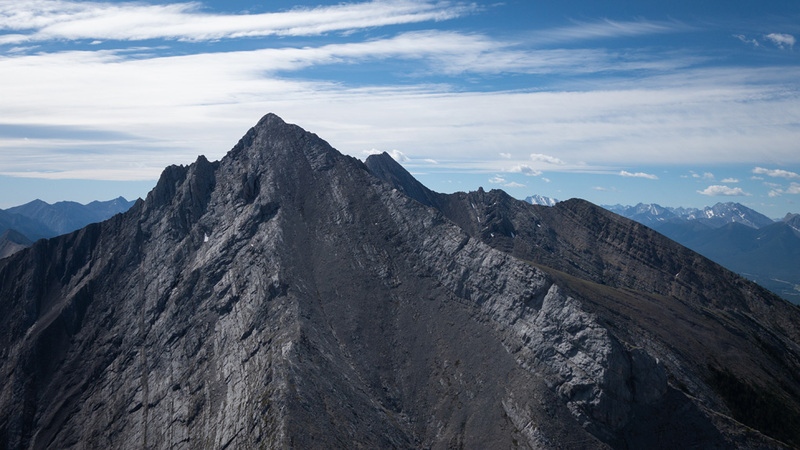 The second counterintuitive point of the day will come when your ascent of McGillivray begins with tackling the northwest ridge of Skogan Peak. From the creek, ascend the open grassy hill in front of you, trending slightly to the climber's right. 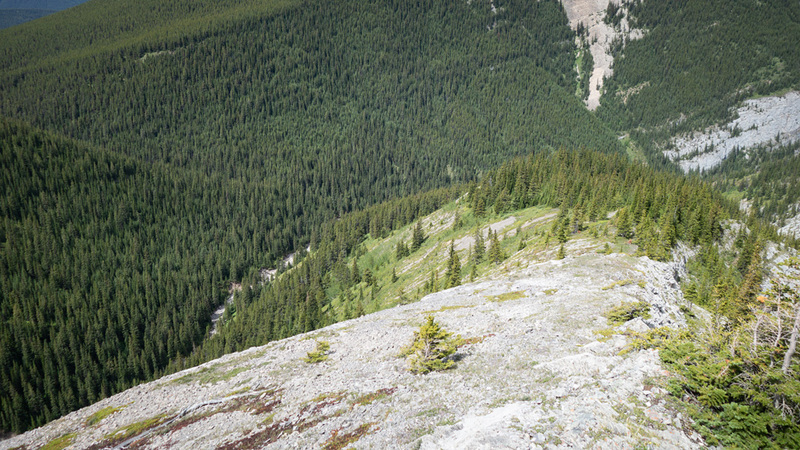 You'll encounter a thick treestand on your left as you near the crest; thankfully there's no need to pass through this, instead continue hiking up along the grass towards an impossible looking buttress above. 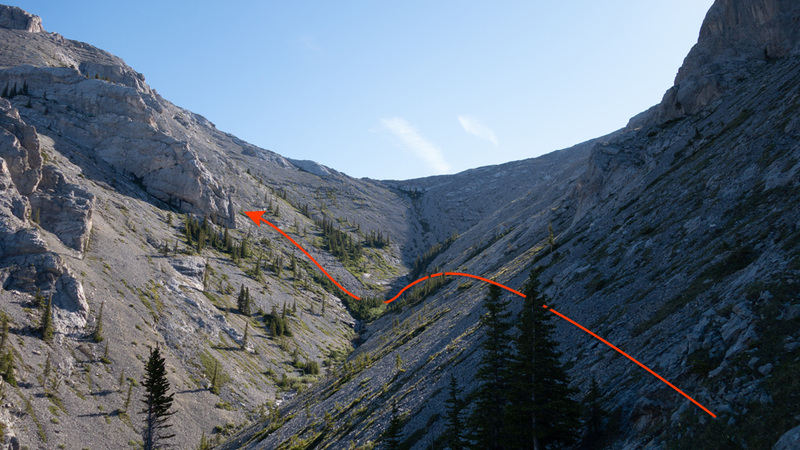 Before hitting a literal wall at the buttress, you'll find an easy traverse on your left that leads into a large bowl below the McGillivray/Skogan col. This traverse is dotted with numerous lateral trails thanks to the armies of sheep which patrol the range, so the sidehilling was minimal. You have a few route options once in the bowl. Both Alex and Sid followed the skyline from the col to the summit. From my vantage point, I could see a natural line that would bypass at least 3-4 cliff bands (two of which are massive). 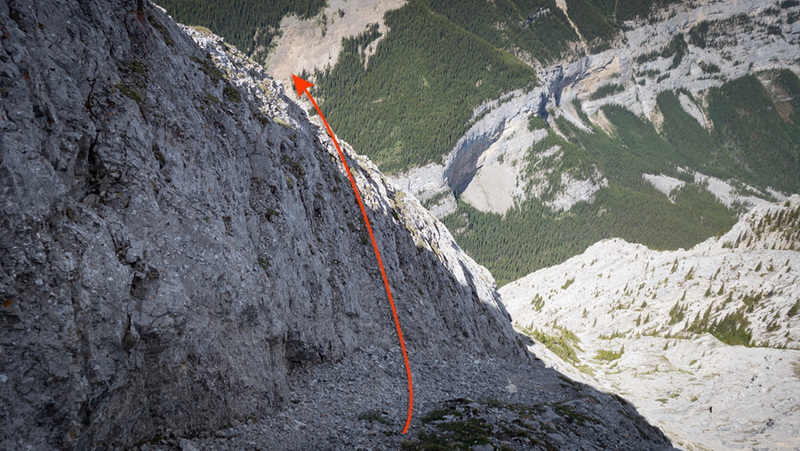 All routes to the top are difficult on McGillivray, but you can choose how sustained that difficulty may be. Being a practical person in general, if the mountain provides a ramp, I'm taking it. Thankfully nothing's foreshortened while following the ramp route, and within 40 minutes I found myself at the base of the summit block. 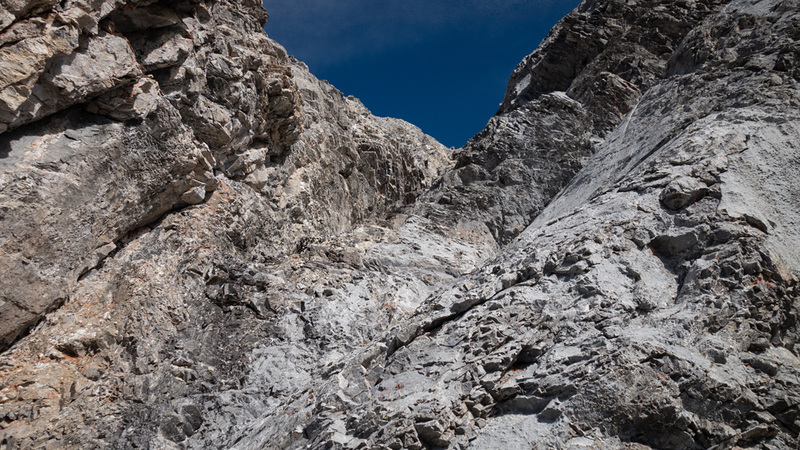 Initially, I began up a steep slab feature towards the plateau above, before thinking better of it and finding a far more moderate ledge switchback that was accessible from a scree gully on my right. Soon I was on the plateau evaluating the last section of the climb. When you reach this point, take a few minutes to scout your options thoroughly. I took the best line I could see, but never ventured up to the crest, and that's where both Alex and Sid found something to their liking – beyond the view of my photos. If neither suit your fancy, you could follow my downtrack around to the north side of the summit and try your luck there. The first half of my line was the crux of the ascent, requiring some zig-zagging to link slabby ramps to reach the entry point of a rock chimney. This section, with its mix of cracks, shallow holds, the use of friction, isn't so much technically hard as it is exposed. I was very methodical with my movements here. 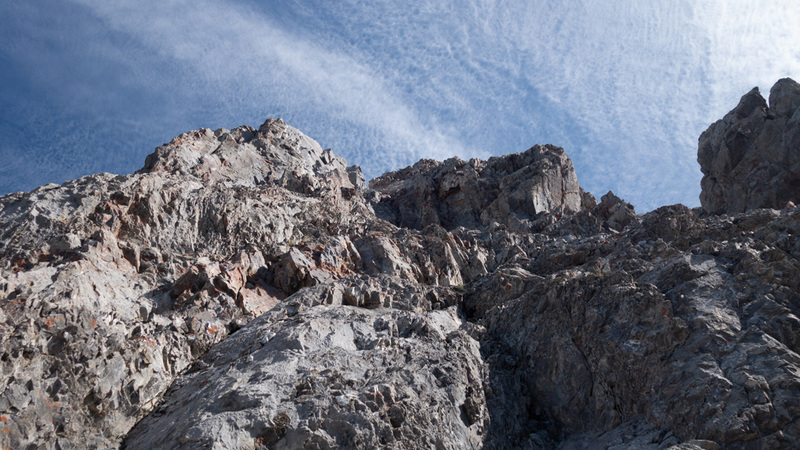 Once reached, the chimney was fun, the rock was good, and there were plenty of quality holds. I quickly made my way through and into the funnel area above where looking back down my path was eye-opening! It's best to not look down too much while negotiating the crux chimney on the summit block. It wasn't an issue for me as I was soloing, but any groups repeating this route should do this section one at a time. The funnel area has a fair amount of loose material to unleash, so don't have anyone follow until the person(s) above is/are in a secure position. 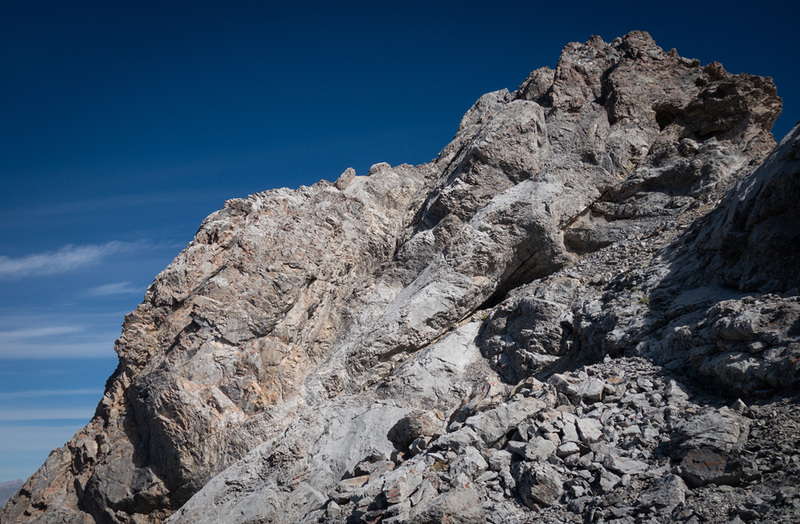 From the funnel, enter a gap in the rock to your right where, after overcoming a short 2m step, the summit awaits. 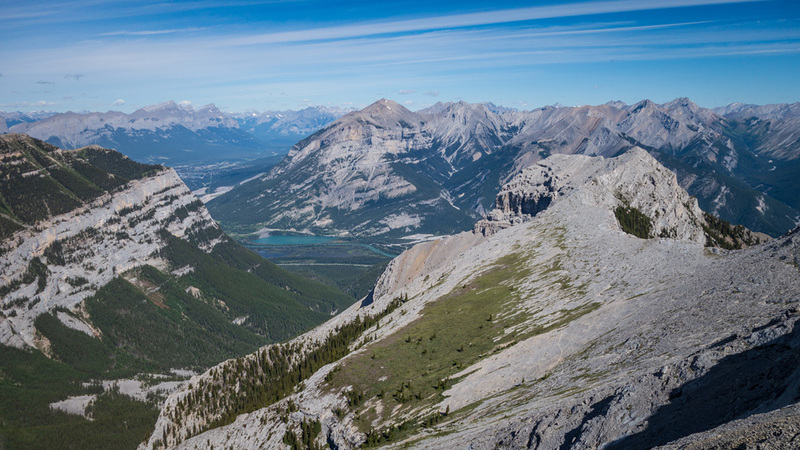 Having endured constrained views all day to this point, the commanding perspective over the Lac Des Arcs area and the prairies beyond was a nice reward for the effort. The fragments I had read about doing McGillivray from the southwest glossed over the whole descent part, and all I knew was to look for a line down on the north side of the summit and that it was supposed to be more moderate. While this is technically correct, it was a slightly milder version of difficult than the ascent. 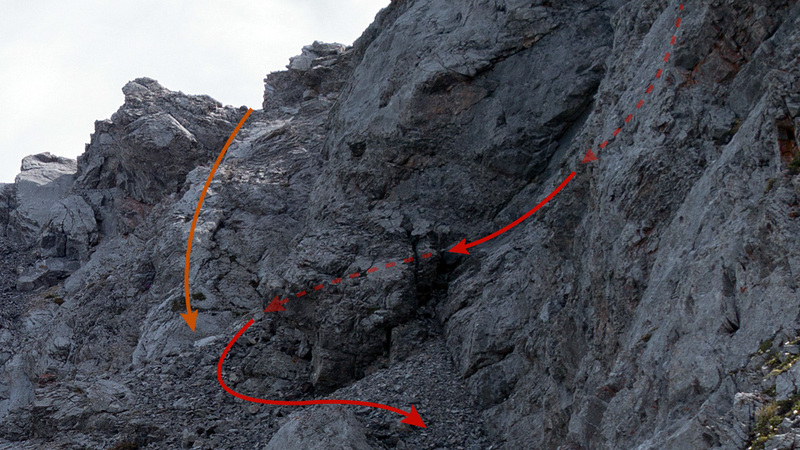 The north side of the summit block has a series of lateral cliff bands that descend into a large, open bowl, and the key is to arrive at the highest ledge if you hope to swing around the southwest face of the mountain to retrace the ascent route. There's likely only 2 (and maybe 3) spots where you can drop in without missing it. 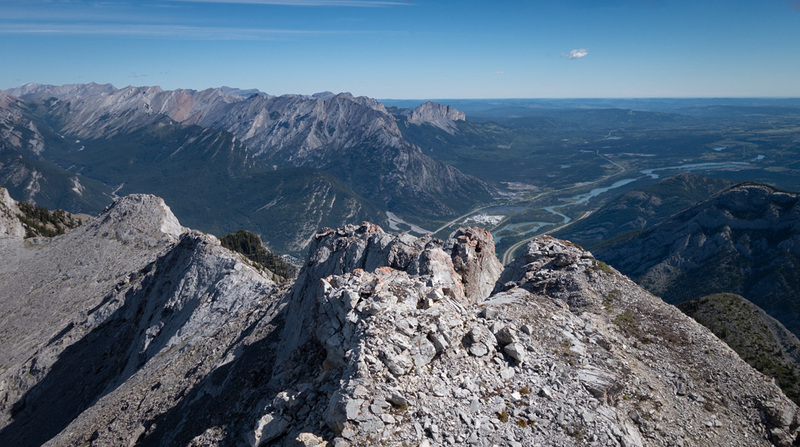 The northwesterly summit view towards Canmore and Grotto Mountain. 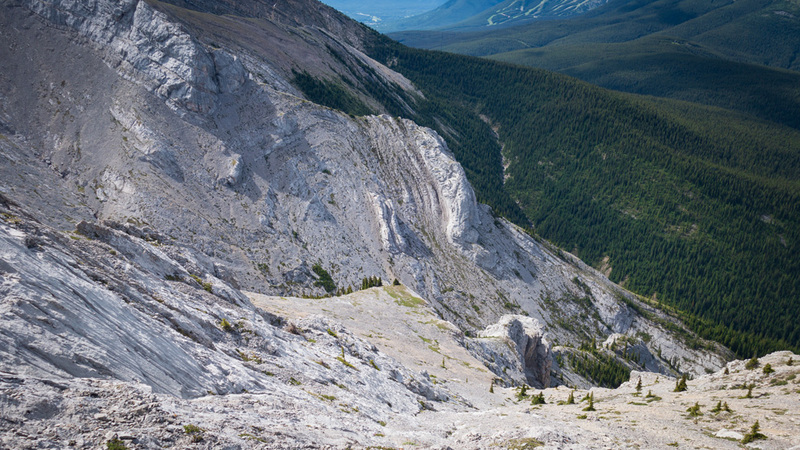 McGillivray's upper ridge extends for a long distance on the right. I took the first descent gully, and that went well until I encountered a 3m, slabby cliff, the top half of which had virtually no holds. To get through, I had to use a series of friction holds to descend diagonally to the safety of a rock gap on the far side. 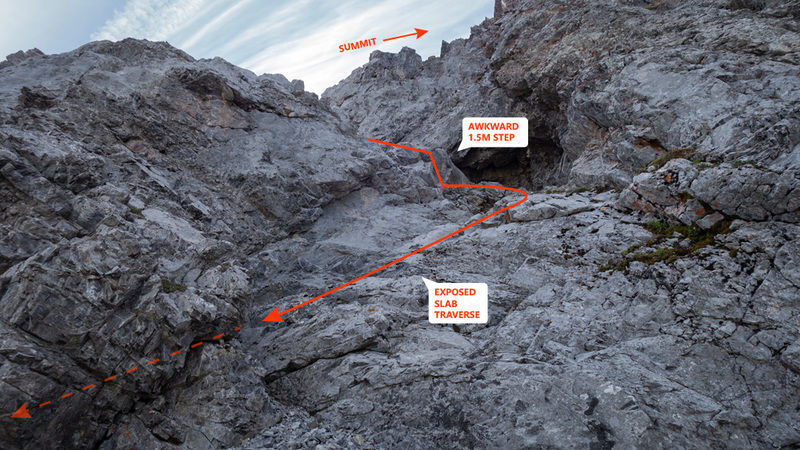 This exposed traverse didn't feel great, but thankfully I was sporting a relatively new pair of approach shoes with good grip. This path may have been a no-go with boots. When comparing notes with Sid, it seems he descended the next gully over. 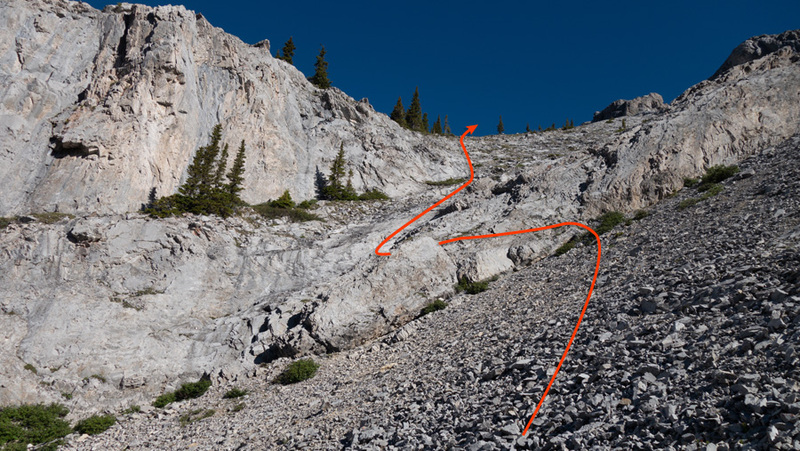 I didn't get a great look at that line, but it may require a 6-7m downclimb on a similarly slabby cliff, although with more available holds. As suggested before, when you reach this section of the mountain, explore your options and know that there are more than one. 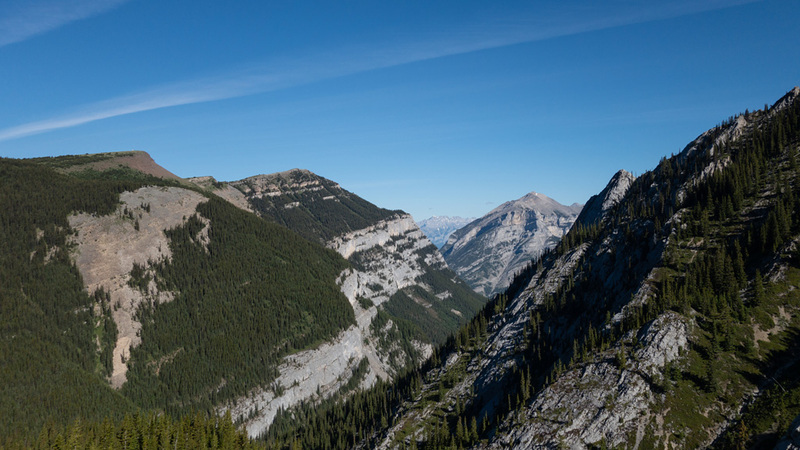 In the worst case, you can follow the traditional route back to the highway, although you would face an additional 6-7km hike to your starting parking lot. 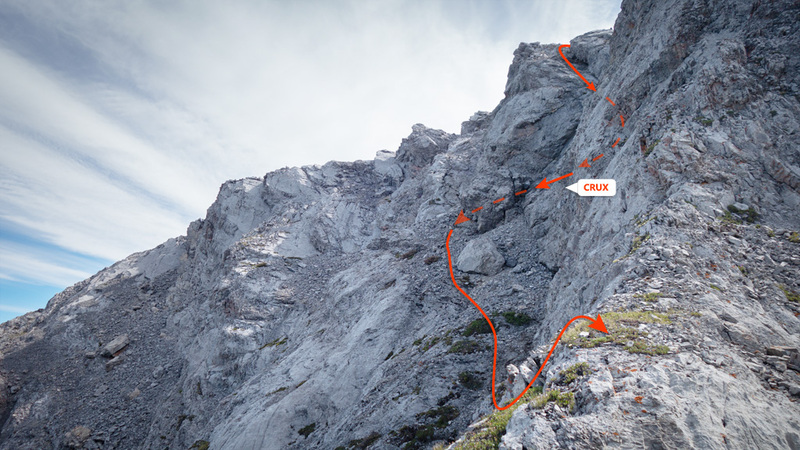 Whatever route you take, assuming you descend to the right ledge, you'll find a narrow ramp that will lead you to the ridge crest on the skier's left, and from there, a short descent on scree and an easy traverse leftward to rendezvous with your up track. Remember to traverse to the skier's left until you're peering into the bowl below the McGillivray/Skogan col. If you descend too early, you could set yourself up for all kinds of fun adventure! The rest of your day will involve retracing the approach. Although I was bikeless, the return along the Skogan Pass trail was very fast even on foot. Within an hour I was back to the car, and soon on my way for success snacks! 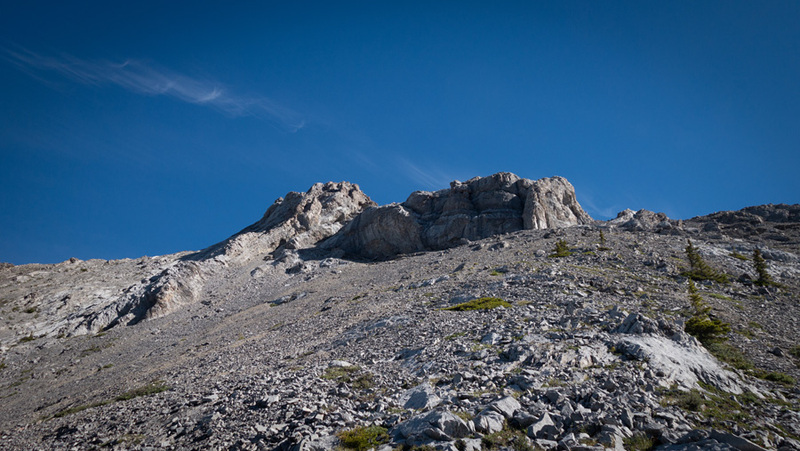 Tackling Skogan from the McGillivray/Skogan col is likely the easiest way to summit that mountain; requiring a roughly 1.5km ridgewalk in each direction. However, if you haven't already climbed Mt. 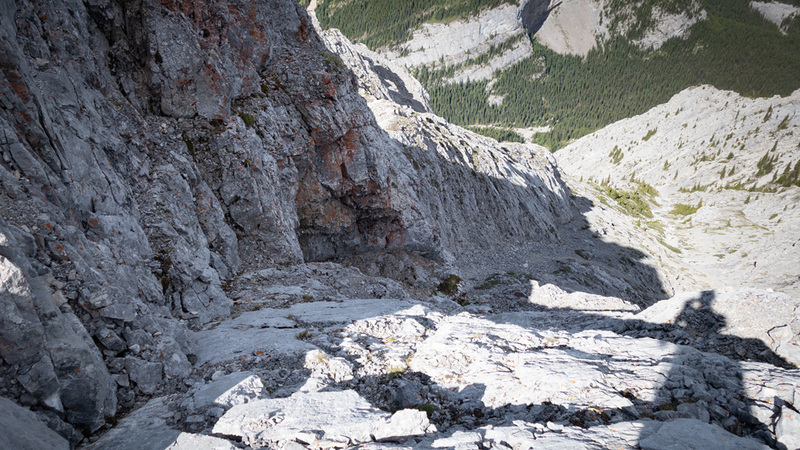 Lorette, the traditional route for the pair is far more scenic and definitely the way to go. Summit: 2,775 m / 9,104ft. Summit: 2,728 m / 8,950ft. Summit: 2,135 m / 7,005ft.